Time to dust off those questionable Hawaiian shirts, put your wellies on standby and assemble your raving crew. After many months of sporadic weather, indoor club nights and heightened summer anticipation, festival season is finally here and it’s bigger than ever. 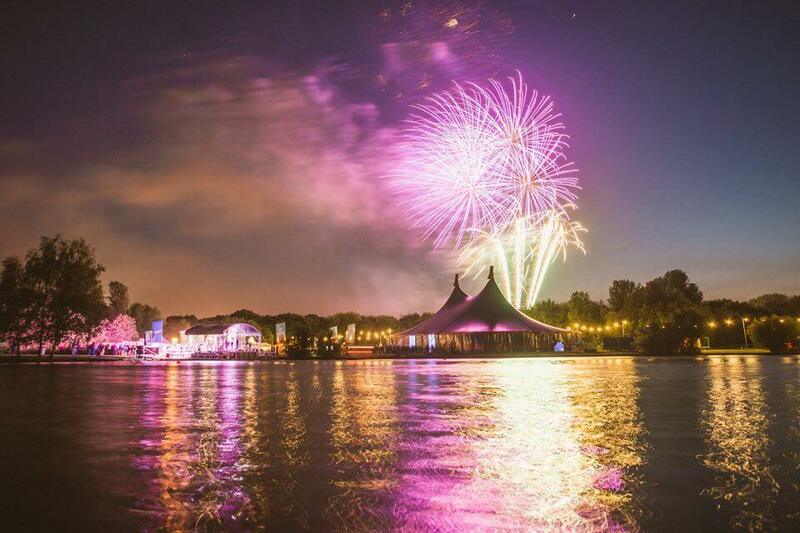 Arcadia officially kicked off UK festival proceedings in explosive fashion last weekend and excitement levels have skyrocketed for what is sure to be a memorable summer. From intense five day music-driven blowouts, to intimate boutique experiences where you can party with the likes of Black Sun Empire in a cowshed – the festival scene in the UK is well and truly booming. Brunel, Banksy, Roni Size, countless varieties of cider… Bristol has many iconic creations to celebrate, but Love Saves The Day is one that comes with a particular sense of pride. The two-day festival has grown into one of the most exciting small festivals in the UK, perfectly displaying Bristol’s flourishing underground scene alongside attracting pioneering artists from across the world. This year will see main stage performances from Fat Boy Slim, Sampha, Tom Misch and a unique showing courtesy of David Rodigan and The Outlook Orchestra. To add to this, local promoters RUN will be hosting a mammoth drum and bass stage spearheaded by Andy C and Camo & Krooked. Despite having a scintillating line up, this festival is about more than just the music – it’s a true taste of Bristol’s good nature and flamboyant character. From secret ball pit parties and roller discos, to boxing rings and random challenges dotted through the festival. Over the years Detonate has become one of the UK’s most reputable music brands, cementing its name as the midland’s ultimate bass powerhouse. Set in the idyllic surroundings of Nottingham’s oldest country park, the one day festival comes armed with some serious firepower, including Shy FX, Giggs, Bad Company UK and Hospital’s latest signees Kings of The Rollers. Not to mention Hype b2b Hazard, SaSaSaS, Sub Focus, Friction, Dimension, Break, Benny L, Turno and stacks more. Highly regarded as one the UK’s best music festivals for rap, grime, garage and house, Strawberries & Creem returns this year with its biggest and most ambitious festival to date. With the absence of formerly neighbouring The Secret Garden Party, Strawberries & Creem is likely to see its busiest year to date. Set in the musically rich city of Cambridge, line-up highlights include a UK exclusive from T-Pain, alongside performances from Not3s, Shy FX and Kojo Funds. This year the one day festival will celebrate its fifth anniversary, welcoming approximately 10,000 people to Haggis Farm. We know what you’re thinking though… June 16th = World Cup. Don’t worry, as there will more than likely be a screen to catch all of the action – if you can pull yourself away from the music that is. One of the UK’s best kept festival secrets, Cirque Du Soul’s El Dorado has been quietly building up a reputation as one of the liveliest and most colourful boutique festivals in the country. Taking place on Big Chill Festival’s old stomping ground, the vibe is open, friendly and full of fun in all directions: Sister Sledge, David Rodigan, Nightmares On Wax, Wilkinson, Shy FX, Chris Lorenzo, Conducta, Echo Knight are just a smidgeon of the acts scheduled to play while daytime funzies such as bingo lingo and dance-offs will max out your jokes account from the moment you wake up. A genuinely special gathering, this one never disappoints. Shortlisted for ‘Best Medium sized festival’ and ‘The Grass roots Festival Award’ in 2017, Beat-Herder continues to demonstrate just how good this festival is. Beginning life as a 1200 capacity party in the sun-soaked Lancashire countryside (yes the first festival was actually blessed with a heatwave) Beat-Herder has gone on to gain 16 additional areas for music over the years, along with 40+ stalls. Nestled deep in rural Herefordshire, Nozstock represents a family-friendly festival that has been going strong for twenty years. When you think of a true off the grid, hedonistic party in the countryside, think of Nozstock. From partying in a cowshed with S.P.Y and Dillinja, to listening to house and alternate dance in a bullpen – this festival basks in the nostalgia of an illegal ’90s rave. Spread across nine stages is a strong roster of artists and acts, ranging from Chase & Status and Black Sun Empire, to Grandmaster Flash and Goldfrapp. Alongside the big name acts, there are also intimate showcases to be found in secluded areas of the festival. Maybe after-dark experimental cabaret is your thing?… Nozstock firmly believes in the value of not only entertaining, but in participation and contribution, so expect to get involved in many of the whacky yet brilliant activities and workshops on offer. This festival needs no introduction. You’ve seen the videos of Noisia tearing up the Bang Hai Palace stage, and you’ve shed a tear at missing out on that unreleased TQD and My Nu Leng intro. Every year Boomtown continues to surprise, amaze and provoke countless Facebook deletes as the post-festival videos and statuses roll in. It’s a festival constantly expanding and pushing the boundaries – growing from a 1000 capacity event in Chapter 1, to a 60,000 strong celebration from Chapter 8 onwards. South West Four has come on leaps and bounds over the last few years. Spread across two day events, the festival has gained a reputation for hosting monstrous line ups along with putting on dazzling productions. When you have Netsky b2b Jauz b2b Slushii on the line up, combined with Dizzie Rascal, Andy C, Craig David and Camo & Krooked live, you know it’s going to be a special weekend. Set in the heart of London, South West Four not only has a very convenient, but crazily hectic tube transport connection, it is also blessed with many chill out areas across the expansive Clapham common for that much needed getaway from the action at times. Sundown’s organisers have revamped the festival experience for 2018 – most notably the larger Mystree Woods with two stages and more raving space, alongside the addition of a brand new campsite with closer dedicated parking. As summer comes to a close and the thoughts of the upcoming winter begin to creep in, Hospitality In The Park provides one last festival hit as an unofficial end of summer party for the 12,000 drum and bass heads in attendance. Based in London’s Finsbury Park, the one day festival is entering its third year and has become one of the highlights of the summer calendar. Last year’s festival was a resounding success and saw the brilliant addition of the Med School Warehouse – a dark and gloomy venue ideal for those murky rollers. You’ll be happy to hear that the stage will be returning this year, along with yet another ridiculous line up. In terms of stages, Let It Roll will be making an appearance again with a mysterious stage concept in The Portal Show, alongside stages curated by the likes of Outlook and Run. The list of artists spread across the day is phenomenal, and if you’re like me at last year’s festival, you’ll be running between tents like a crazed mad man in order to catch clashing sets… Etherwood Live, Mefjus, Goldie, a two hour b2b from Dbridge and Nu:Tone, Dillinja – the list goes on and on. But, one of the most eye-catching inclusions has to be the prospect of Kings of The Shadows – a one off combination between The Shadow Demon Coalition and Kings of The Rollers. Hospitality In The Park is without going to be special.